Wireless personal activity trackers from Misfit debut at the 20th Philippine Fashion Week with Melchor Guinto’s “Enigma” collection of sporty and elegantly edgy menswear and ladies wear pieces. beyerdynamic headphones accentuate this sophisticated piece from the “Midnight Rose” collection of Filipino designer Randall Solomon. Jeffrey Rogador’s Holiday 2016 collection “Prints and Patterns” complement the minimalist design of laptop bags from HK-based brand thecoopidea. Staging a comeback in the fashion special were Moshi and Case-Mate. Moshi featured its wide array of carryalls and gadget carrying cases, paired seamlessly with Sidney Perez Sio's ensemble of his signature athleisure pieces. Moshi bags and cases were made from innovative materials like premium water-resistant fabric and vegan leather. The bags have cushioned compartments to protect laptops and plenty of pockets for chargers, cables, and other necessities − ideal for daily use or occasional business trips overseas. A model struts the runway holding Moshi’s Codex laptop carrying case. Her outfit is part of fashion designer Sidney Perez Sio’s athleisure look for the 20th Philippine Fashion Week. A FITTING FINALE. Intricately designed sparkly dresses characterize Cherry Samuya Veric’s “Viva!” collection, much like Case-Mate’s fashion-forward bands for Apple Watch. 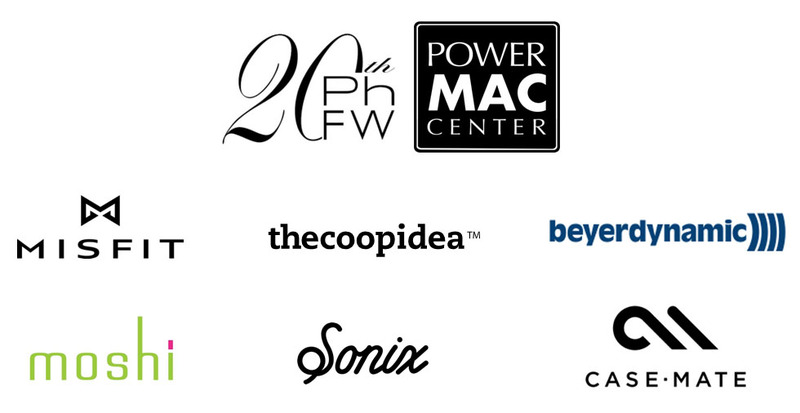 Power Mac Center is celebrating its 22nd anniversary through a series of lifestyle events anchored on the arts, music, and fashion.